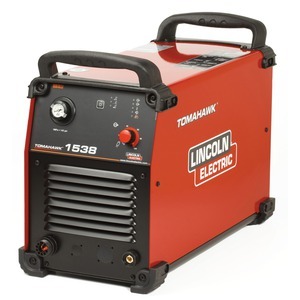 The Tomahawk® 1025 and 1538 Plasma cutting machines are built to handle harsh environmental conditions using Lincoln tunnel technology to separate the PCB’s and sensitive parts from the contaminating cooling airflow. 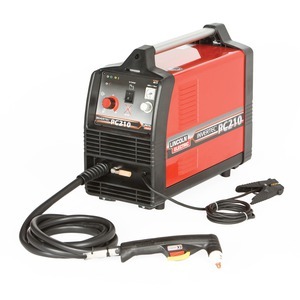 The improved mains voltage tolerances and robust metal case with large protective rubber corners also make these machines suitable for operation on site with a generator or within a workshop environment. 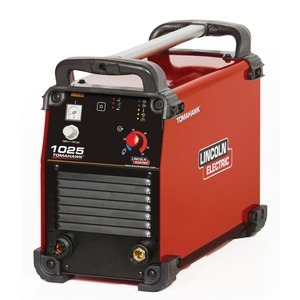 The Lincoln Tomahawk® concept for Plasma cutting focuses on three elements: S – An innovative and patented striking system preserves the electrode tip and extends its lifetime. P – Circular enhancements with improved radial airflow and innovative electrode/nozzle design concentrate the plasma stream. L – The internally cooled electrode and torch head and electrode/nozzle design considerably increase their lifetime. Starting – innovative advanced arc starting without HF. Performance – Innovative advanced electrode and nozzle design. Longer lifetime – Innovative advanced design increases lifetime of consumables. Faster – higher travel speeds and plate thickness. Flexible – Multiple torch configurations. Concentrated plasma stream – Less heat input, less distortion. Variety of materials – Mild steel, Stainless Steel, Aluminium and many more.